Continuing a theme from my last post, here is another animal from a different park. Like the shark at Epcot, the hippos at Animal Kingdom don’t typically do anything exciting in front of the guests. However, this guy in the Gorilla Falls area was particularly active yesterday. He opened his mouth several times, giving me the chance to get this shot. There are so many interesting fish and sea creatures to be found in The Seas with Nemo & Friends at Epcot. However, when I give tours at this park, most of my guests really want to see the sharks. They usually stay low and toward the back of the tank, but this guy came right up to the glass yesterday. This skull is in Adventureland, but not near the Pirates ride. It is part of the “Pirates Adventure” interactive quest. I took this shot while waiting for my tour guests to complete their climb and descent thru Swiss Family Treehouse. Space Mountain is one of those attractions where I’ve taken hundreds of pictures over the years. However, I’m always looking for a different angle or different lighting. I found both of these while walking on the path between Magic Kingdom and The Contemporary, a few nights ago. Once Upon A Time is an amazing projection show that takes place on Cinderella Castle each night. It highlights many of the classic Disney movies, with a few newer ones mixed in. This scene features Cinderella and Prince Charming. 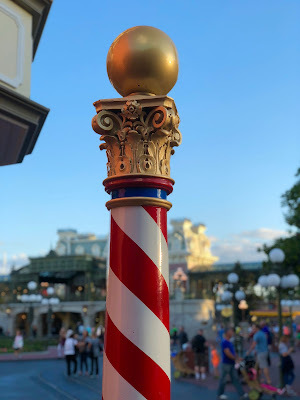 Ever since we moved to Florida, I’ve only gotten haircuts at the Harmony Barber Shop in Town Square at Magic Kingdom. There is something special about this place, which is set in the early 1900s. With a Starbucks and a barber shop, this area of the park feels like a real town. Over the past seven years of posting pictures to Digital Disney World, I have taken more shots of Thunder Mountain than any other attraction. But, today was the first time I was able to get dinosaur skull near the end of the ride. The train passes it quickly, and it’s not easy to get a clear shot. However, I was able to grab it today by utilizing a relatively new feature on the iPhone, which allows you to scrub through and pick a “key photo” from a Live Photo. After a nearly year long refurbishment, The Hall of Presidents reopened last month. As expected, President Trump has a speaking roll, and he recorded his own voice for the audio-animatronic figure. The movie part of the show is entirely new, along with the music, and the narrator. Overall, Disney did a nice job with the new version of this classic attraction. Holllywood Studios is full of fun details related to Hollywood, CA. Some are in plain site, but others are relatively hidden. This little staircase near 50’s Prime Time Cafe, makes reference to apartments upstairs. These hidden gems certainly add to the overall theming of this park. Disney Springs has come a long way since it was called Downtown Disney. This area was built from the ground up, in what used to be the parking lot. I took this shot last week, and you can see that the Christmas garland was still up. The Walt Disney World monorail is one of the more unique forms of transportation to be found anywhere. Although it serves the important function of carrying thousands of people around the resort each day, it is also a fun, futuristic, and fast moving ride. This shot shows monorail gold pulling into the Magic Kingdom station. The Tree of Life at Animal Kingdom has over 325 animals carved into it. Some of them can only be seen on the trails around Discovery Island. I took this rhino and bird shot at the base of the tree yesterday, while giving a tour. The Valley of Mo’ara is the area of Pandora created for the new Avatar section of Animal Kingdom. It is a lush landscape filled with unique Pandoran flowers and plants. I took this shot today, while standing near the entrance to the Na’vi River Journey. The Barnstormer is a classic “kid” coaster in the Storybook Circus area of Magic Kingdom. The airplane themed ride flies right thru this giant billboard. If you look closely at the bottom airplane in this picture, you’ll see a classic hidden Mickey in the middle of the propeller. Tusker House at Animal Kingdom is home to a fun character dining experience. It features Donald and friends, and a wide variety of African inspired foods. I took this shot today, from an area near the back of the restaurant. The “Move It! Shake It! Dance & Play It!” street party is very popular at Magic Kingdom. It features the traditional Disney characters, but there are also some newer ones as well. I took this shot of Frozone today, as the float he was on paraded down Main Street. Disney Springs has added many shops and restaurants during its changeover from Downtown Disney. However, the Rainforest Cafe has remained the anchor of the east side of the complex. We had lunch there today, and I took this quick shot of an elephant. Echo Lake sits near the center of Hollywood Studios. During this holiday season, it was decorated with giant, floating Christmas ornaments. I took this shot today, while giving a tour. You can see Dockside Diner in the background. The long running Cirque du Soleil show, La Nouba, came to an end last week. However, there is already a new show in development. Meanwhile, Disney is promoting the new Star Wars movie with this projected image on the outside of the Cirque du Soleil theater. The area next to Muppet*Vision 3D at Hollywood Studios has recently undergone a makeover as part of the Star Wars construction. It is now called Grand Avenue, and it represents a street in Los Angeles. Concurrently, the fountain in front of the theater was refurbished, and Miss Piggy has returned. During the holiday season, the Jungle Cruise now becomes the “Jingle” Cruise. The jokes and even some of the props become themed to Christmas. This Gorilla scene is a good example of the changeover. The Christmas tree in the Magic Kingdom is an impressive site, which can been from quite a distance. However there are some fun details at the base that need to be viewed up close. This “Lilly Belle” train, which can be found among the presents, is a nice touch. Happy New Year! As this holiday season comes to a close, I wanted to post a shot of the entrance of the most popular theme park on earth. Throughout November and December, the giant Mickey head is made up of red poinsettias, which set the stage for the amazing decorations that are found on Main Street. I took this shot shortly before Christmas.